I have definitely had a good share of BBQ’s in my life – both before I went vegan and after. And burgers have somehow always been something that was part of a good BBQ party with friends. Ever since going vegan I’ve moved the burgers more into my regular cooking routine, rather than waiting for sunny weather and the next BBQ party and have therefore started to create more diverse burger recipes for every occasion. I have had plenty of bean burgers but to be honest: they are not the easiest to create, as they fall apart easily if done wrong. 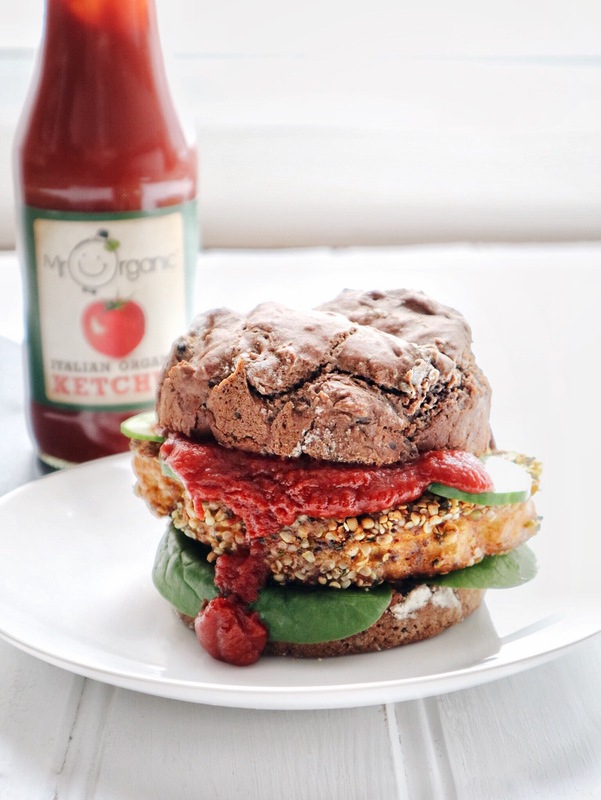 The creation that is this crispy cauliflower burger however is definitely a fool proof one! The tastiest things can sometimes be the simplest to create! Such as this super delicious cauliflower burger that I’ve created for the first time last year. As you will find in this recipe, a crispy burger does not always need to mean plenty of breadcrumbs (and carbs!) and oily mess as I have used hemp seeds to create the crunchy goodness of this burger. The spices I have used in this recipe are simply some of my favourites – but hey: there are endless options! How about seasoning this one with your favourite curry powder, some turmeric and black pepper? Wash the cauliflower and cut into slices. In a large bowl blend the Milled Linseeds and chickpea flour with plant based milk and use the spices to season the batter to your liking. On a shallow plate mix the hemp seeds with the spices. Flip the cauliflower slices in flour, then cover them with batter. Let the batter drip off slightly before pressing the slices into the hemp mixture on both sides, then transfer into a pan with hot oil to fry. Little note on the side (or at the bottom, to be precise! ): this burger tastes absolutely amazing with a dollop of Mr Organic Tomato Ketchup!